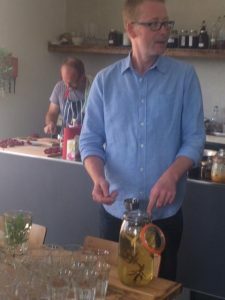 I was lucky enough to visit Otter Farm as a reward for investing in a crowdfunding project – billed as “A Taste of Otter Farm – a tour of Otter Farm with Mark, including a two course lunch”. Both of these elements were well up to expectations! I’d met Mark a few times at food events organised by my friend, the cookery writer Rosemary Moon, at West Dean Gardens near my home in Chichester. Otter Farm is in East Devon, very close to the River Otter and near to Honiton. Previously Head Gardener at Hugh Fearnley-Whittingstall’s River Cottage empire nearby, Mark left a few years ago to work on his 17-acre Otter Farm. Over time he has developed an orchard and a vineyard, built a house featured on Grand Designs, and built the subject of the Crowdfunder, a kitchen garden school: “a place to learn about growing, cooking, preserving, building, fermenting and more”. 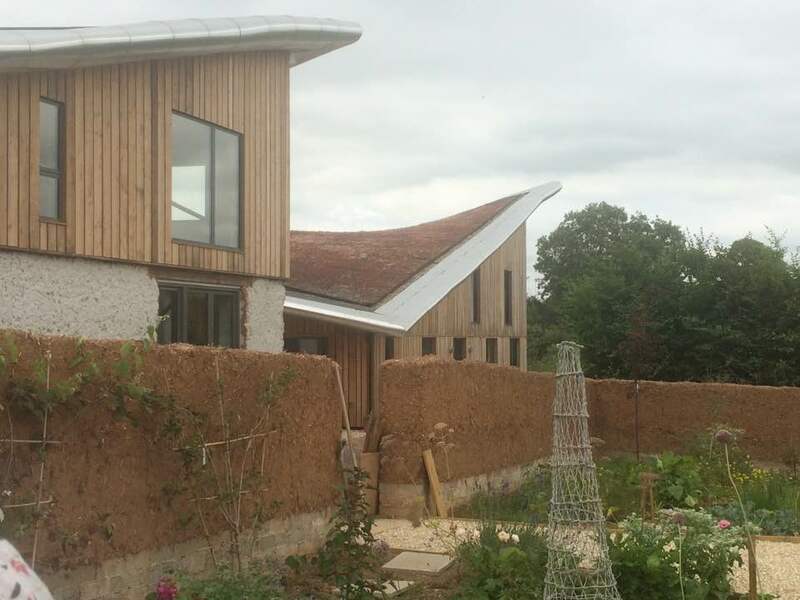 Both the house and kitchen garden school are designed around eco-friendly principles, the most noticeable element being the green roofs, which are clearly visible because of the way the buildings are designed. The event was attended by about 18 of the 45 people who had pledged for this reward. We were greeted with jugs of mint or “cucumber” water (refreshing on a warm summer’s day). The latter contained large sprigs of salad burnet – the smaller leaves are best used in salads but the bigger ones work really well in water and do taste of cucumber. I’m not a fan of commercial flavoured water and even a slice of lemon in water can be too much for me, but I loved the herbal water and will be trying this at home! Once the whole group had assembled we were given delicious canapés of beetroot puree garnished with summer savoury. These were accompanied by a fabulous cocktail of Mark’s home-made limoncello topped up by his own sparkling wine. I had sampled Mark’s herbal cocktails at West Dean, so knew this would be good, and I was glad to be staying at an Airbnb just a short walk away! Next we were treated to an in-depth tour of the newly planted vegetable garden, based on forest gardening principles with mostly perennial plants. Cob was used in the construction of the kitchen garden school and Mark decided to use it for the walls of the garden too, adding a real rustic feel. The garden was full of plants I had never heard of, or variants that were new to me, even though I thought I was quite well up on unusual vegetables and herbs. I’ll cover just a few of the plants that particularly caught my eye or appealed to me in some other way, otherwise there would be far too many to cover! 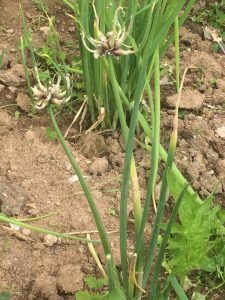 The Egyptian walking onion produces onions similar to shallots but what is different about it is that it grows its next generation of onions at the top of the stalks. These mature during summer, sending out small roots and shoots of their own. The flower stalk falls over, and the bulbils root where they touch the ground. The next year these form onions in their new location, grow a stalk with bulbils on top – which then falls over to repeat the process. 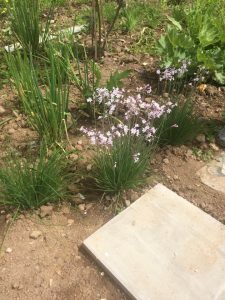 Continuing with the allium theme, we were also shown Welsh onions (not from Wales and not an onion as we know it as it doesn’t grow bulbs) and society garlic grown for its flowers and more like chives than garlic and so named because apparently it is less pungent on the breath! Moving onto herbs, sweet cicely has attractive fern-like leaves, has an aniseed flavour, and can be cooked with rhubarb using less sugar because of its natural sweetness implied by its name. Scotch Lovage has red stems which answered a question for me – I saw Scotch lovage in a kitchen garden a few years ago, just labelled as lovage, bought some lovage seeds, and wondered when they grew why they didn’t have red stems! Apple mint (which I grow myself and used in my much admired apple and mint [or apple and apple mint jelly]!) is very good in water. Mark recommends growing mint in pots if you grow more than one, otherwise they cross and the individual taste can’t be distinguished. Mark is a big fan of ginger rosemary. He also grows several varieties of hyssop, including anise hyssop, very good for attracting bees. One strange fact I learned was that dahlia tubers were eaten 200 years ago; this makes me wonder if that is why they are often grown on allotments, particularly by the more elderly allotmenteers? Perhaps they are carrying on a tradition for cut flowers that originates in them being grown to eat. Mark is growing fuchsias for their fruit, which is also something you don’t get to hear about much! 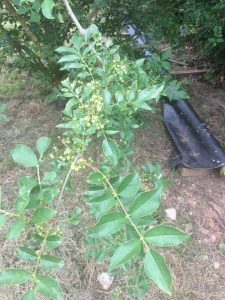 On the way back to the house we saw Japanese pepper and Szechuan pepper plants. The latter should be picked when bright red (useful advice for me as I bought a plant from Mark a few years ago and it has produced a good crop for the first time this year!). The peppercorns can be used fresh or dried in the sun so that they go through a pepper mill. Another variety of Szechuan pepper is apparently very lemony. We all sampled a Szechuan peppercorn so that we could feel the tingly, numbing sensation it produces on the tongue! Among the more unusual fruit trees grown here are the plumcot tree (I’ll leave you to guess which trees ones have been crossed here!) and the Juneberry, a fruiting species of Amelanchier. Back at the house we were treated to a splendid lunch of local belly pork (Mark runs courses on butchery) followed by a most delicious chocolate cake. The chef for the day was Matthew Williamson, former co-owner of Flinty Red restaurant in Bristol. To accompany the food we had Mark’s own cider and wine – I sampled both and thoroughly enjoyed them! Mark can be found in my neck of the woods in the Gardening Theatre on all three days (11-13 August 2017) of the West Dean Chilli Fiesta.